As fresh and fragrant as the spice it is named after, Cinnamon restaurant at Trident, Chennai offers a cheerful ambience with food to match. The menu offers dining options ranging from favourites from the regional Tamil cuisine to a variety of Asian, European and North Indian delicacies: salads, Dim Sum, Mezze platters, risotto, pasta, wood-fired pizza, vegetarian and non-vegetarian Indian curries, stir-fried Asian noodles, gourmet sandwiches, burgers and homemade ice creams. The breakfast buffet here is ideal for a refreshing start to your day. Take your pick from a wide range of hot and chilled dishes, complimented with a cup of hot south Indian coffee or fresh fruit juice. Step in for a business lunch or high tea and catch up on work with colleagues. Open from 06:00 a.m. to 11:00 p.m., Cinnamon is the perfect place to grab a bite to eat with family, friends and business associates, at any time. 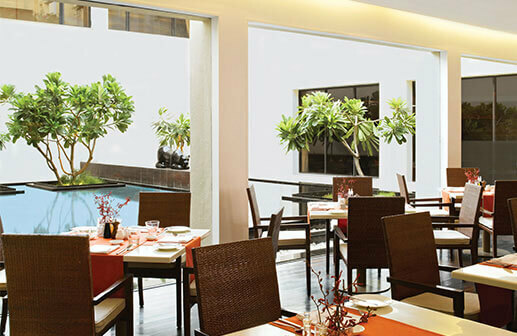 Enjoy Cinnamon buffets at special prices - lunch buffet at INR 1400 and dinner buffet at INR 1650. All prices are per person and inclusive of taxes. Spread the holiday cheer this season, feasting on traditional turkey and pudding with warm mugs of mulled wine, eggnog and unlimited imported spirits. After all. ‘tis the season to feast. Dates: 24th and 25th December, 2017. Succulent steaks and grills. Our chefs have prepared a delicious menu with the choicest meats, seafood and vegetables. Enjoy unlimited draught beer and soft beverages with our lunch buffet. Sunday Brunch - With the best Indian and international dishes, live counters and complimentary drinks, enjoy a feast with the family and make your Sundays special.